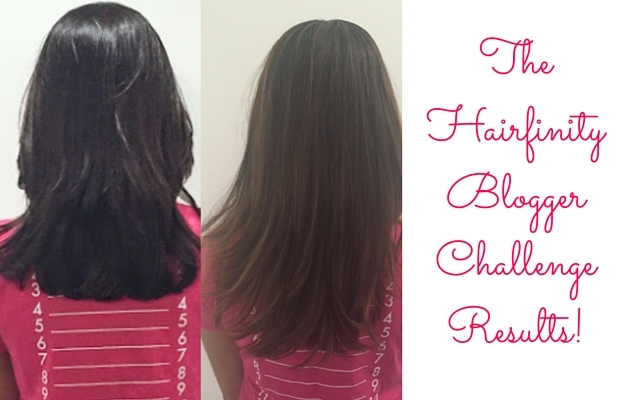 The Hairfinity Blogger Challenge Results! Last November, I posted about an exciting challenge I had just started – the Hairfinity Blogger Challenge. For those of you who are unfamiliar with Hairfinity, they are a haircare brand best known for their super hair growth tablets which are used by none other than Kim Kardashian. As part of the challenge, I was given a 3-month supply of their tablets plus their strengthening shampoo and conditioner to try out in return for an impartial review. In my previous post, I talked about my hair growth woes plus the incredible ingredients in Hairfinity which include 18 essential amino acids, Vitamins A, B1, B2, B3, B6, B7, B12, C, D3 and calcium and folic acid – which sound very promising. I’m just going to cut to the chase and tell you that Hairfinity really worked. In the three month period that I took the tablets, my hair grew a whopping 3.5 inches, the average rate of hair growth is 0.5” a month so Hairfinity more than doubled the rate of my hair growth. As with any tablets the effects weren’t immediate, it took about a month to start seeing a difference but once the tablets started working their magic, even my friends and colleagues commented on how quickly my hair was growing! It was genuinely that noticeable. I must add that Hairfinity doesn’t just work on the hair on your head, hair everywhere starts growing super-fast so you’re going to be BFFs with your eyebrow lady/waxer/razor. For me, it was a small price to pay for a bumper boost in hair length though. I have one caveat to the fantastic results I experienced. Just after I started taking Hairfinity, I got super sick (chest infection, atypical pneumonia and a stomach infection…horrific) so I didn’t eat as healthily as I normally do and is recommended while on the tablets and I also skipped a couple of weeks here and there when I was on antibiotics and other medication. I’m pretty sure that if I were eating all my greens and took the tablets as religiously as I should have, my hair would have been at least 0.5” longer. Hairfinity worked so well for me, I would thoroughly recommend it if you’re desperate to grow your hair or your hair growth has reached a plateau. I’m super happy with the length of my hair for now but I’m already planning on doing another cycle in autumn to give my hair another boost. If you’ve tried Hairfinity before or have any questions, please leave a comment.